So here we are, many years later after the peaceful breakup of the old Soviet Union, and we see the West engaging in a world hegemonic drive we once told our own citizens we were fighting to prevent…being subjugated by the communist hordes. Why we are doing this rarely raises a whisper in our political forums, like Congress. If you ask the White House all they usually say is, “we are pursuing/protecting our interests.” But for some odd reason they do not feel obligated to explain exactly what those interests are. As for those countries who are deemed to be threats, we are never told how they really threaten us. Now it seems we have the people of Crimea as our new enemies. They did not want to live under the boot of a Western-backed coup that utilized the services of nationalist terrorists, so they exercised their humans rights to defend themselves, no thanks to the phony democracy-loving West. They voted almost 97% to become federated with Russia. They wanted to live free from fear…of us. The Yanukovich government had decided to remain economically close to Moscow, due in large part to the huge subsidies that the Russian people have given to Ukraine and were offering to continue, when the West was only offering refinancing. Trying to avoid what has happened, Yanukovich had made huge compromises with the opposition, but the agreement was broken before the ink was dry by the violent takeover by armed nationalists. The independent Intel community is certain that the US embassy was fully aware of what went on with their full approval, including the killings, because it served some Geo-political goals the US had for the region… undermining Russia. Mad Man McCain even told us that after Ukraine, Putin was next. You just can’t make this stuff up. Unfortunately, diplomatic immunity prevents those involved in these capitol crimes not to be prosecuted, something that I will be addressing in future columns, as most major international crime is being done under the auspices of government sanction, including many Western countries. 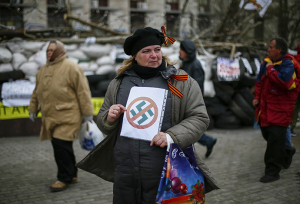 Kiev is now probing the perimeters of some of the referendum cities with obvious uncertainly. They have not been sure that troops would follow orders to engage the protesting townspeople in combat. Today we saw generally poor results as young Ukrainian troops on the APCs found themselves surrounded by unarmed civilians, including many babushkas with video cameras filming away. At VT, we concluded these were young troops who were being used as bait to hopefully trigger some nasty fighting, which Kiev and the US could claim was a massacre by Russian troops, as they are still peddling that worn-out lie. Many troops surrendered their vehicles to the home guards, were cheered and treated well, and we hear tonight were being released with their rifles so they can’t be used for hostage propaganda. Western media coverage of the East Ukraine crisis has been a disgrace to the profession. The Russian Foreign Ministry was understandably outraged with some of the American accusations of Russian troops and agents orchestrating the popular revolt against the coup. The proof offered can only be described as absurd, like the mention of Kalashnikov rifles being carried by some of the men in combat fatigue dress. The State Department is not stupid. It knows that East Ukraine is home to large numbers of veterans and reservists, and such weapons are common all over the former Soviet Union states and among local law enforcement people. The US claims that Kiev’s military deployment is to protect the rights of all Ukrainians, but this is a false flag in itself as within a day of such statements, we find local news reports of presidential candidates being beaten up by Right Sector thugs, not only in Odessa but Kiev itself where local police just watched and did nothing. I had predicted in past columns that the coup-meisters would use the nationalists to intimidate the remaining opposition, those who had not already run for their lives. While we hear of an investigation by Kiev authorities, we know that the general prosecutor’s ministry was given to the nationalist Svoboda party of Oleg Tyagnibok. There will be no real prosecution against Kiev’s political allies for such crimes. The East Ukrainians knew what was coming their way. Their best protection was to make sure they were not forgotten by the people of the Western countries, whose governments are supporting the coup-meisters and all the nasty things they have been doing. I agree with the Russian ministry that it is gross hypocrisy for the US to claim any credit for caring about the Ukrainian people. Our government under Bush(43) and now sadly Obama, has been working to destabilize Ukraine for many years and many billions, as Victoria Nuland had stated so proudly. Added to that shame is the mass censorship of anything that could be called real journalism. Most of the publics I refer to above are not aware of the extent of the lying, unless they are Internet savvy researchers who know where to look for it. Getting the true story out is left to independent media which is held in contempt by corporate media, as we are their sworn enemy, and rightly so. Once part of the key foundation for preserving and protecting hard-earned republics, corporate media has gone over to the dark elite forces for the monetary rewards. We have one ray of sunshine in the otherwise shameful Ukraine media coverage due to head of EU intelligence, Commodore Georgij Alafuzoff. He was dismissive of the Western hype, stating that Russia had nothing to do with the takeovers of the administrative buildings… “In my opinion, it’s mostly people who live in the region who are not satisfied with the current state of affairs.” Alafuzoff totally supported the Russian position that the East Ukrainians were trying to protect themselves from a coup government that has publicly admitted to being hostile to the Eastern region. I don’t expect any major fighting prior to the four-party talks on Thursday. The shadow boxing continues as Kiev tries to consolidate its position by trying to work out a reverse gas flow agreement with Slovakia at the lower price and trying to get their hands on the initial IMF monies. My bet is they want the Russians to cut off or decrease their pipeline shipments to Europe as a way of escalating the economic tensions between East and West. Washington can then pretend that future stiffer sanctions were the result of Russian aggression, when it is clearly the US. The wild card there is the EU has a huge trade surplus with Russia that it wants to maintain. The US is playing some economic choke-hold cards, also. The continued crisis works for them, as the ruble’s exchange rate is down. Currency flight was double the first quarter of 2014 over the previous one, with over $50 billion flowing out. Russian businesses that are invested heavily in Ukraine also risk huge losses if the economy implodes. So as the Russians have sincerely and pragmatically stated, they seek a political solution, not a military one. The four way talks are being poisoned already with the usual deal killing pre-demands. Kiev is requesting Crimea back, and incredibly… wants to give orders to the Russian general staff to move the border region troops away from the border area while Kiev is moving troops forward. This is not a joke. They really said this. The rest of us must put pressure on our own governments that we are watching their behavior closely in this sad affair of misguided statesmanship. Jim W. Dean, managing editor for VeteranToday.com, producer/host of Heritage TV Atlanta, specially for the online magazine “New Eastern Outlook”.